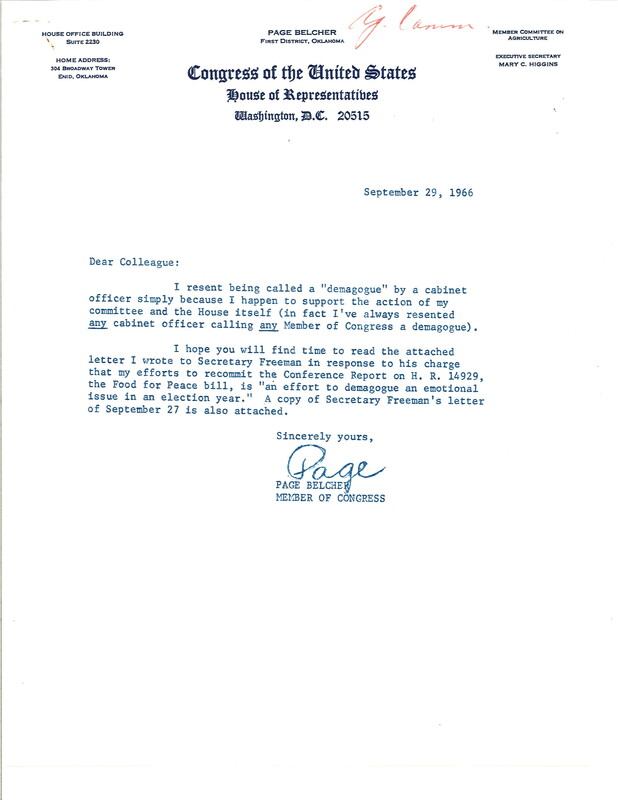 A Dear Colleague letter from Page Belcher that uses a perceived insult in a letter from Secretary of Agriculture Orville Freeman to argue for an amendment to block North Vietnam and Cuba from benefitting from the proposed Food for Peace program. Includes a letter to Speaker Albert from Secretary Freeman addressing the alleged insulting comment. Carl Albert, 1910-1998. "Dear Colleague letter and accompanying documents from Page Belcher." Carl Albert Collection, Legislative, Box 81, Folder 55, Carl Albert Center Congressional Archives, University of Oklahoma. Accessed 19 April 2019. http://acsc.lib.udel.edu/items/show/472.